Ambassador James David McGee, a career member of the Senior Foreign Service in the class of Minister Counselor, spent the majority of his 30-year Foreign Service career overseas working in support of U.S. Government policy. Most of his work included political-military affairs, crisis management, and international negotiation and management. He has been U.S. Ambassador to Zimbabwe, Swaziland, Madagascar, and the Comoros Islands. James David McGee was born in Chicago, Illinois. He graduated from Indiana University in 1968 and then served as a pilot in the U.S. Air Force during the Vietnam War from 1968 to 1974. While in Vietnam he earned three Distinguished Flying Crosses. Also while in the U.S. Air Force, McGee learned Vietnamese at the Defense Language Institute in Monterey, California. He also speaks French. Ambassador McGee began his career in the Foreign Service in 1981 and from 1982 to 1984 served as third secretary and vice consul at the U.S. Embassy in Lagos, Nigeria. Following these appointments he was an administrator officer at the American Consulate in Lahore, Pakistan (1984-1986), secretary and supervisory general services officer at the U.S. Embassy in The Hague, Netherlands (1986-1989), and administrative officer at the American Consulate in Bombay, India (1989-1991). Additionally, Ambassador McGee was assigned to the U.S. Department of State in the Bureau of Finance and Management Policy from 1991 to 1992. 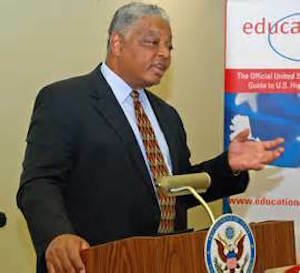 Other overseas tours included his serving as administrative counselor at the U.S. Embassy in Kingston, Jamaica from 1995 to 1998 and administrative counselor at the U.S. Embassy in Abidjan, Côte d’Ivoire from 1998 to 2001. In 2002, President George W. Bush nominated McGee to become U.S. Ambassador to the Kingdom of Swaziland. After U.S. Senate confirmation he arrived in Mbabane, the capital, and served there until 2004. President Bush then nominated him to serve as the U.S ambassador to the Republic of Madagascar where he served from 2004 to 2007. While in Antananarivo, the capital of Madagascar, he represented U.S. interests in the Indian Ocean island nation of the Comoros. In 2007 President Bush nominated McGee to become the U.S. Ambassador to Zimbabwe. During his tenure in Harare, the capital of Zimbabwe, McGee was threatened with expulsion from the nation by President Robert Mugabe in 2008 after he told the local press of politically inspired attacks by the Zimbabwe government against Morgan Tsvangirai, who was the opposition candidate for President. Despite the accusations, President Mugabe did not expel the U.S. diplomat and McGee served out his term which ended in October 2009. After returning to the United States Ambassador McGee joined the Department of Defense’s Africa Center for Strategic Studies as senior diplomatic advisor. He assists the Center’s director in representational responsibilities at conferences, events, and official functions in the U.S., Africa, and Europe. In 2010 he opened in Naples, Italy the first political-military office which is intended to provide diplomatic guidance to the Commander of U.S. naval forces in Europe and Africa. In 2008 Ambassador McGee was presented the Diplomacy for Freedom Award by the U.S. State Department. In 2011 the Department honored him with the Palmer Award for Diplomatic Excellence. Ambassador McGee is married to Shirley Jean French McGee. US Department of State, http://2001-2009.state.gov/r/pa/ei/biog/7061.htm; American Academy of Diplomacy, http://www.academyofdiplomacy.org/members/bios/McGee.html; Africa Center for Strategic Studies, http://africacenter.org/2009/09/former-ambassador-mcgee-to-serve-as-acss-senior-diplomatic-advisor/.